MASH 47 will start at 1400 (2:00 P.M.) so try to arrive by 1330!!! 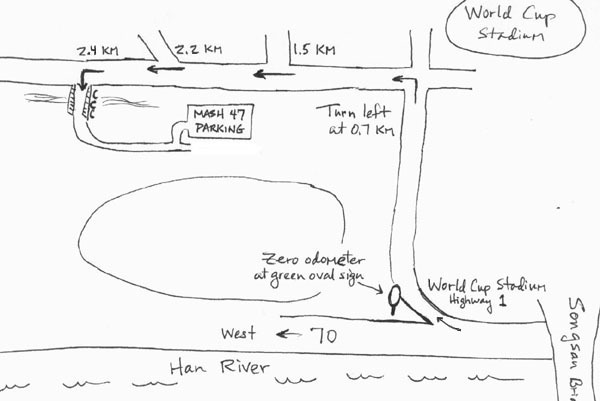 By Car: Locate World Cup Stadium (West Seoul, north of river). Follow Road # 70 (along north bank or Han River) direction Ilsan (west). Immediately after passing Songsan Bridge, move to right lane for World Cup Stadium exit on newly designated Highway 1. As you exit, ZERO you odometer when you pass an Oval green sign. Continue towards stadium. At 0.7 km, turn left at traffic light intersection. Continue past right sided intersections at 1.5 km and 2.2 km. Prepare to turn left. At 2.4 km, turn left to cross bridge. Follow road to enter parking area by driving between temporary construction buildings. Get ready to hash around the new parks surrounding the World Cup Stadium!!! By Public Transportation: Take subway line #6 to Mapo-Gu Office Station (# 620), take Exit # 1, Wait there for pickup at 1330 and 1345. If there are four or more at anyone time, Call 011-9703-0026 or 011-777-8196 to let us know you are there and someone will come pick you up. Runners and walkers will enjoy exploring the new parks, new trails, and new hills around the World Cup stadium! Lots of great views!! You can leave a bag and any post-hash goodies you might have brought to share in a car while hashing. If you get lost, call 011-9703-0026 or 011-777-8196. There will not be a grill available as it is not allowed in the new park areas! We will have the usual chips, snacks, and drinks for all to enjoy!